Far too many leaders confuse self-care with selfishness. Our social movements need leaders at the top of their game rather than stressed out, sleep deprived and exhausted leaders. Chronic stress and exhaustion reduce a leader’s attention span, increases emotional volatility and fosters poor decision-making. Senior leaders often influence organizational norms and when they model poor self care practices, those behaviors tend to be replicated by staff throughout the organization. 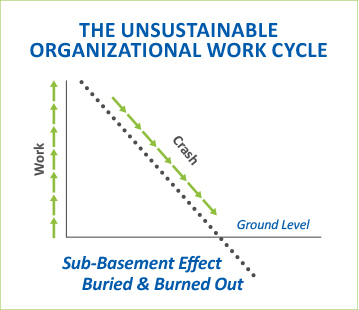 So that we find our organizations are staffed with exhausted, chronically stressed individuals on the road to burnout. Where’s the wisdom in that? For organizations conducting advocacy work and engaged in time sensitive campaigns, the work pace is especially grueling and becomes unsustainable over time. The diagram seen here shows a workflow model where the pace of the work escalates unrelentingly; more and more is demanded of staff and volunteers as the campaign or project unfolds. Staff and volunteers then crash in exhaustion after the campaign or project has finished until the next cycle begins with a new campaign or project. For a while the organization seems to be at the vanguard but the pace is not sustainable. Over time energy reserves are depleted, people begin to burn out and it becomes increasingly difficult to reach even a baseline level of people power and energy upon which to build a campaign. In the end, these organizations find themselves on the road to burnout and risk becoming ineffectual. Leaders who model a more sustainable work pace have a longer view perspective. They understand that retaining staff means our movement benefits from their expertise and knowledge over the long term. Moreover, they understand that social transformation work begins with oneself. As Mahatma Gandhi noted, we must “be the change we seek in the world.”2 The diagram seen here illustrates a more sustainable model for social action that intentionally builds space for renewal, reflection and celebration. 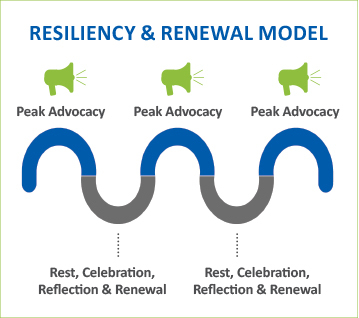 This model builds resiliency and keeps our people — our most precious resource — inspired, energized and thinking at their best. How has the quality of your leadership been affected by lack of self-care, chronic stress and exhaustion? What is the habit that most adversely impacts your self-care right now? Moving forward, what single new behavior can you substitute to practice better self-care? What’s your action plan for practicing this new behavior consistently? Who will you ask to support you in this endeavor? How will you remind yourself and track progress? 1 Robert Gass. 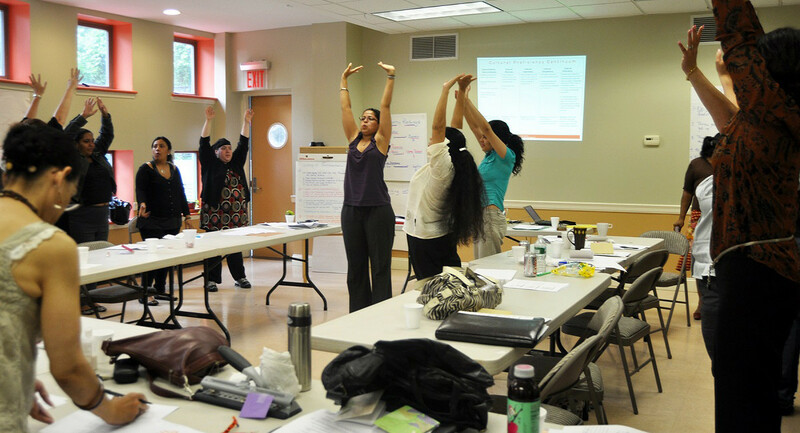 “Boundaries for Work: A Contract With Yourself.” The Social Transformation Project, 4 Feb. 2015. Web. 21 Apr. 2015. 2 Carmella B’Hahn, “Be the change you wish to see: An interview with Arun Gandhi,” Reclaiming Children and Youth, vol10, n1 (2001): 6-9. Web. [Paraphrased from VOL 13, Ch 153, General Knowledge About Health, Page 241, Printed in the Indian Opinion on 9/8/1913 from The Collected Works of M. K. Gandhi, published by The Publications Division, New Delhi, India.]. 3 David Rock. Quiet Leadership: Six Steps to Transforming Performance at Work. (New York: Harper Collins, 2007). Print.